ACTAtek has worked with many third-party Time Attendance software developers thanks to its open development platform. The ACTAtek Access Manager SOAP API SDK (Software Development Kits) allows software vendors to customise and develop enterprise level applications for many vertical markets today. Providing accurate Employee time stamp information in real time. Software capability to scale with multiple units allowing log information to be exchanged and synchronised between the terminals and the central server. 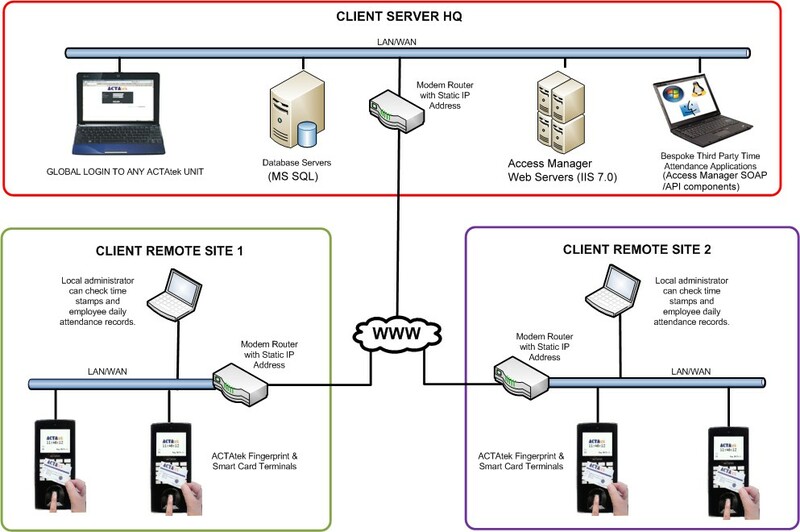 Optional ACTAtek Middleware integration with third party software allows flexibility to use proven technologies such as ACTAtek Agent to exchange transaction data from the terminals to a PC based server. ACTAtek Access Manager SOAP API allows developers to customise functions and enhance the capability of the ACTAtek terminals such as rostering and scheduling. Flexibility to cater software for many input formats such as Smart Cards, Key Tags and Optical Biometric Fingerprint technology that are suited to the customers demands. Wired and Wireless Networking functionality opens new potential of deployment scalability and accessibility over complex sites. ACTAtek database exporting facilities allows integration with many popular payroll software to calculate labor costs and work hours. Note:Click the image to enlarge it. A typical installation diagram shown above is just an example of how software vendors can implement their bespoke Time Attendance solution. Multiple ACTAtek units are deployed with unique IP address to a local network of a remote site. Transaction data is exchanged and synced using either ACTAtek's middleware solutions or the Software vendor's bespoke API based on the ACTAtek Access Manager SOAP API to the central server over the Internet. Information is stored on the HQ server where senior managers and administrators can analyse performance and productivity of each remote site to plan and allocate more resources effectively in the future.